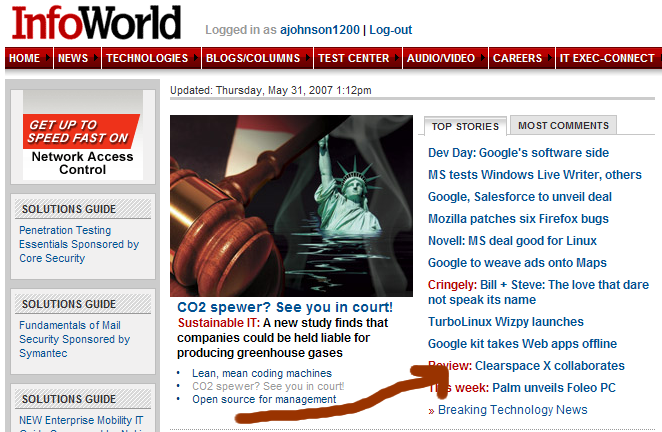 Looks like we’re hanging with some pretty big players on the homepage: Google, Microsoft, Novell, Palm. You can read the full (very positive) review here. Tips on building a community from Matt Haughey. Who says there’s no innovation left to do in the bulletin board / forum software space? Rafe says it’s stunning, I say breathtaking and captivating. I’d pay money just to watch the introduction over and over. So now del.icio.us will get a C&D right? Oh wait… and this goes to my blog! So will I! Counterpoint to all the hype about Apollo and Silverlight. I’m sure this has been out for weeks / months.. but wow, a gift from the browser gods. thanks google!